Skydiving? Yoga? Smoothies? Each and every day, women try new things. We wanted to understand who or what motivates women to try new things, so as part of the POPSUGAR Insights 2014 Healthy Living Report, we asked women to share the details. The decision to try new things often comes down to opinions shared by people who women trust. Therefore, it shouldn’t be a surprise that friends and family ranked highly in our findings. We asked women to select who or what are likely to get them to try new things and overall 78% of women said their friends are most likely to get them to try new things, and 64% of women said that family are most likely to get them to try something new. Younger women were more likely to be influenced by friends than more mature women, but friends rank first for all age segments across the board. 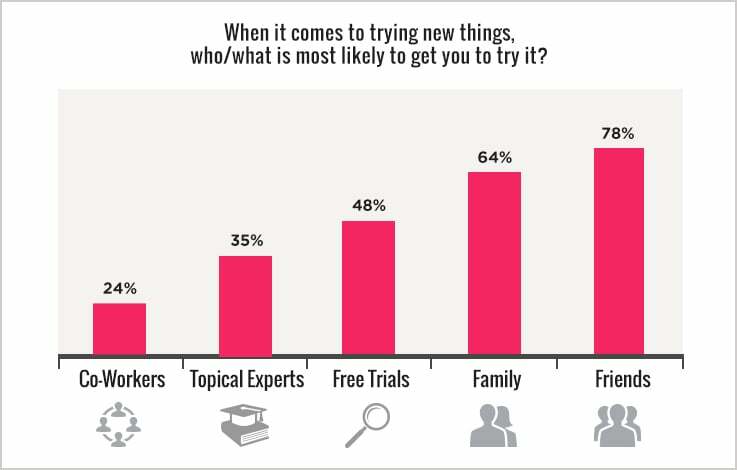 Women between the ages of 21 and 24 were most likely to say that free trials would influence them to try new things. Beyond friends and family, an interesting mix of influencers emerges: 48% of women said that free trials offered by brands would get them to try new things, 35% of women said that professionals or topical experts would get them to try something new, and 24% said that co-workers would be most likely to get them to try something new. Women between the ages of 25 and 29 were most likely to be influenced by professionals or topical experts. Social media posts (20%), advertising (14%), online videos (14%), and apps (12%) all drive women to try new things but to a much lesser extent than trusted resources like friends, family, or topical experts. Celebrities rounded out the list, with only 8% of women saying that they influence them to try new things. For marketers trying to introduce new products into this space and attract female customers, while there is still no substitute for the positive recommendation of friends or family, it’s important to remember that product trials work well and that topical experts and professionals can be important influencers to drive women to try a new product.